To reduce CMNS' carbon footprint in our participation in open house events, campus visit days, and other events for prospective students and families, we have created this Virtual Folder to include helpful websites, links, and resources. 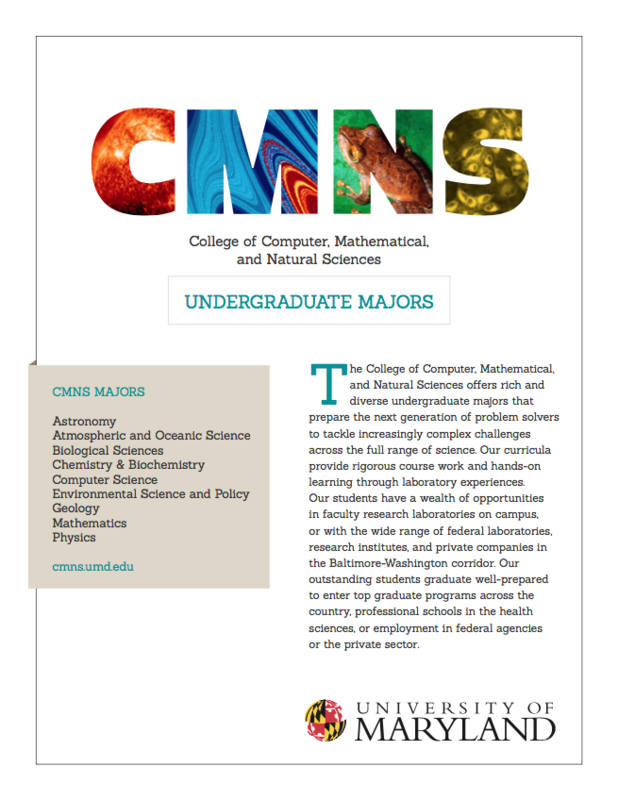 By following these steps, we hope that you find out more about what it's like to be a CMNS Terp! Step 1: Let us know you're interested! Are you a high school student looking to study in CMNS? Fill out this form to provide us with some brief information about you. This will allow us to best assist you during the college exploration and admissions process. Are you on social media? So are we! Check us out on Facebook, Twitter, and LinkedIn. If you are a prospective student, like the page below to learn more about CMNS majors, events, and students! Step 3: Find out about our undergraduate programs! Click the picture to the left to find out more information about our majors. Step 4: Stay informed on current CMNS happenings! Our News & Events page will keep you up-to-date with articles and news clips. Step 5: Utilize your resources! The links on the left sidebar should help you find out more information about the admissions and enrollment process. Our goal is to support you in any way that we can!